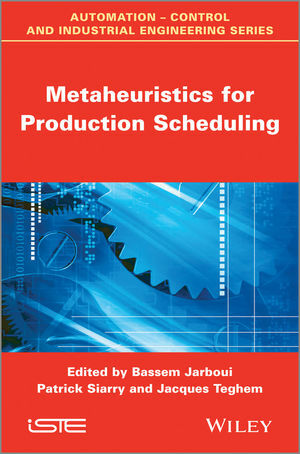 This book describes the potentialities of metaheuristics for solving production scheduling problems and the relationship between these two fields. For the past several years, there has been an increasing interest in using metaheuristic methods to solve scheduling problems. The main reasons for this are that such problems are generally hard to solve to optimality, as well as the fact that metaheuristics provide very good solutions in a reasonable time. The first part of the book presents eight applications of metaheuristics for solving various mono-objective scheduling problems. The second part is itself split into two, the first section being devoted to five multi-objective problems to which metaheuristics are adapted, while the second tackles various transportation problems related to the organization of production systems. Many real-world applications are presented by the authors, making this an invaluable resource for researchers and students in engineering, economics, mathematics and computer science. 1. An Estimation of Distribution Algorithm for Solving Flow Shop Scheduling Problems with Sequence-dependent Family Setup Times, Mansour Eddaly, Bassem Jarboui, Radhouan Bouabda, Patrick Siarry and Abdelwaheb Rebaï. 2. Genetic Algorithms for Solving Flexible Job Shop Scheduling Problems, Imed Kacem. 3. A Hybrid GRASP-Differential Evolution Algorithm for Solving Flow Shop Scheduling Problems with No-Wait Constraints, Hanen Akrout, Bassem Jarboui, Patrick Siarry and Abdelwaheb Rebaï. 4. A Comparison of Local Search Metaheuristics for a Hierarchical Flow Shop Optimization Problem with Time Lags, Emna Dhouib, Jacques Teghem, Daniel Tuyttens and Taïcir Loukil. 5. Neutrality in Flow Shop Scheduling Problems: Landscape Structure and Local Search, Marie-Eléonore Marmion. 6. Evolutionary Metaheuristic Based on Genetic Algorithm: Application to Hybrid Flow Shop Problem with Availability Constraints, Nadia Chaaben, Racem Mellouli and Faouzi Masmoudi. 7. Models and Methods in Graph Coloration for Various Production Problems, Nicolas Zufferey. 8. Mathematical Programming and Heuristics for Scheduling Problems with Early and Tardy Penalties, Mustapha Ratli, Rachid Benmansour, Rita Macedo, Saïd Hanafi, Christophe Wilbaut. 9. Metaheuristics for Biobjective Flow Shop Scheduling, Matthieu Basseur and Arnaud Liefooghe. 10. Pareto Solution Strategies for the Industrial Car Sequencing Problem, Caroline Gagné, Arnaud Zinflou and Marc Gravel. 11. Multi-Objective Metaheuristics for the Joint Scheduling of Production and Maintenance, Ali Berrichi and Farouk Yalaoui. 12. Optimization via a Genetic Algorithm Parametrizing the AHP Method for Multicriteria Workshop Scheduling, Fouzia Ounnar, Patrick Pujo and Afef Denguir. 13. A Multicriteria Genetic Algorithm for the Resource-constrained Task Scheduling Problem, Olfa Dridi, Saoussen Krichen and Adel Guitouni. 14. Metaheuristics for the Solution of Vehicle Routing Problems in a Dynamic Context, Tienté Hsu, Gilles Gonçalves and Rémy Dupas. 15. Combination of a Metaheuristic and a Simulation Model for the Scheduling of Resource-constrained Transport Activities, Virginie André, Nathalie Grangeon and Sylvie Norre. 16. Vehicle Routing Problems with Scheduling Constraints, Rahma Lahyani, Frédéric Semet and Benoît Trouillet. 17. Metaheuristics for Job Shop Scheduling with Transportation, Qiao Zhang, Hervé Manier, Marie-Ange Manier. Bassem Jarboui is Professor at the University of Sfax, Tunisia. Patrick Siarry is Professor at the Laboratoire Images, Signaux et Systèmes Intelligents (LISSI), University of Paris-Est Créteil, France. Jacques Teghem is Professor at the University of Mons, Belgium. Bassem Jarboui, Laboratoire MODILS, University of Sfax, Tunisia. Patrick Siarry, Laboratoire LiSSi, University of Paris-Est Créteil, France. Jacques Teghem, MathRO / Polytechnic Faculty of Mons, Belgium.